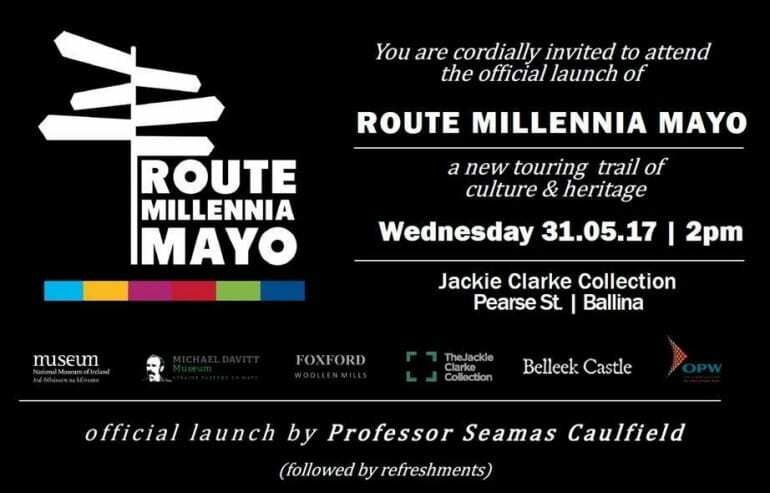 Route Millennia Mayo is being officially being launched at the Jackie Clarke Collection, Pearse Street, Ballina at 2 p.m on Wednesday 31st May 2017. Members of the public are invited to attend the launch of Route Millennia Mayo which will be officially launched by Professor Seamas Caulfield, the leading archaeologist who spearheaded the original Céide Fields project. There will be exhibitions from the six cultural sites featured on the new tourism route on the day. Come and join the launch on Wednesday, May 31st to find out more about this exciting new tourism route. Take in 6 unique visitor experiences along a 60km driving route that spans 6000 years of Irish history and culture. Sample Neolithic structures, medieval armoury, 1916 and Civil War artefacts, a working mill, the Land League story, and a huge taste of Irish country life. Route Millennia Mayo is suitable for self-driving tourists and coach tours. Special arrangements and activities can also be made for primary and secondary school tours. Tearooms and restaurants are located at some of the Route Millennia Mayo stops.